We all eat it but do we know its history? Vegemite was created by Melbourne-based food technologist Cyril Callister (1893-1949) in 1923. Although a similar spread made from concentrated yeast extract, Marmite, was available in England, no one knew its recipe so Callister created Vegemite from scratch. He worked for Fred Walker’s small food company and specialized in methods to preserve cheese using yeast (Walkers was bought by Kraft in 1926 and Callister became their Chief Chemist). The success of Vegemite as a product was bolstered by Callister’s foresight in sending the product to London in 1925 in order to be tested for thiamine Vitamin B activity, thereby highlighting its nutritional value. Thousands of small jars of Vegemite were included in service rations during World War II which not only bolstered sales but also enshrined its place as Australia’s ‘taste of home’. As an attempt to increase sales in the 1920s and 1930s, the name Vegemite was changed to ‘Parwill’ from 1928 to 1935. An ad campaign with the slogan ‘Marmite but Parwill’ was a huge flop, and the name was changed back to Vegemite in 1935. A more successful ad campaign in the 1950s (see video) introduced the jingle ‘Happy Little Vegemites’, a term now used to describe a contented person. This entry was posted in ANDC and tagged Australian English, Cyril Callister, Vegemite by Sarah Ogilvie. Bookmark the permalink. My mother used to complain to me that the authentically Australian Vegemite had been purchased by the big scary American Kraft Foods – as though it represented everything evil about globalisation in the late 20th Century. I guess she had no idea that Kraft had a stake in Vegemite since before her own father was born! 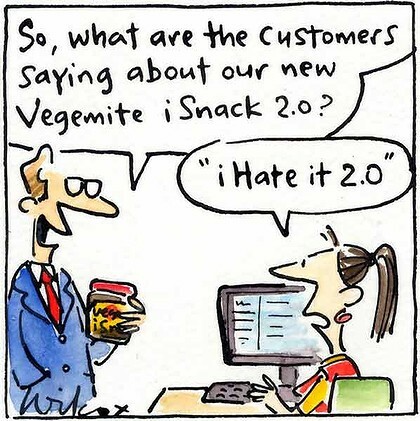 Apparently the name Vegemite was pulled out of a hat in a competition – clearly a more successful choice than iSnack 2.0 turned out to be when they re-tried the gimmick a few years ago. Mighty cheesy, indeed. Thanks, Drew!